After a long hard winter everything can start to look a little bit bare, especially steel structures exposed to the elements. With spring in the air it's time for a fresh lick of paint and that means companies who specialise in painting have to be prepared for an influx of business and the associated materials handling. 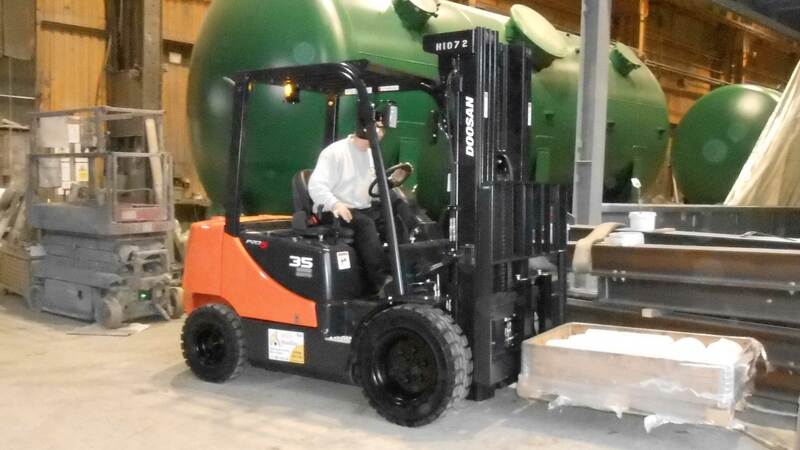 Therefore it was perfect timing for a Yorkshire based specialist paint company who recently took delivery of a brand new Doosan D35C-5 forklift truck from Ability Handling. The company carry out grit blasting for surface preparation using chilled iron grit on tanks, vessels and structural steels, as well as completing the full spraying of fire protection paint using Chartek and Firtex applications. All of these materials need to be unloaded, relocated and stored at the company’s premises, which comprise a large factory site. This means that reliable materials handling equipment is essential and for the third time in a row, the company have chosen a Doosan machine from Ability Handling. The new Doosan D35C-5 is particularly versatile and so is the perfect truck for this application as it will have to undertake a wide variety of tasks. The service from Ability Handling is just as versatile as the Doosan range of forklift trucks and we offer a variety of methods for customers to acquire the equipment they need. Our prices are among the most competitive in the business and we also provide a full maintenance package where required. The paint company have once again chosen to make use of a contract hire agreement which, based on a 5-year timescale, delivers the very best value for money. Contact us today to find out all the information about our contract hire services.